Pope Gregory the Great (590 to 604) transformed church administration, refined the practices of monasteries and wrote some of the most important Biblical commentaries of the middle ages, notably his 'Moralia in Job'. 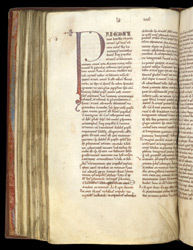 This manuscript is Volume I of a two-volume copy of the 'Moralia', having part of the Book of Job and the first half of the 'Moralia'. Made early in the 12th century, it belonged to the Cathedral of St Andrew at Rochester. The cathedral, named for the monastery in Rome where Gregory had begun his career, was founded in the early 7th century by Augustine, the missionary--also a monk from St Andrew's, Rome--whom Gregory had sent to Britain to convert the Angles. The medieval popularity of the 'Moralia' was due to its theme of personal, interior spirituality: how does one forge within oneself a Christian soul? The Book of Job, too, tells a great story. This page has the beginning of Book (Section) 8 of the 'Moralia in Job'. It begins with a large first letter P which originally was red, painted with a toasted lead pigment, but the lead has changed back to a silvery grey metallic appearance. The initial (first letter) differs from the ones in the first part of the book, which are decorated with snarling animals and plant patterns. Downgrading the decoration of initials toward the end of a manuscript was a usual practice of medieval scribes and artists. It was a way of saving resources, but also it may indicate a second artist or scribe working on the manuscript or it could indicate the opening of a sub-section.